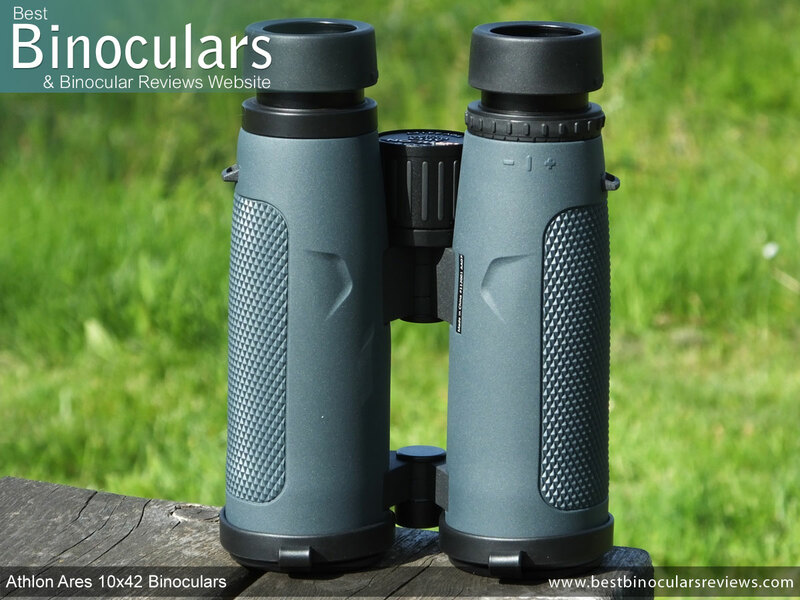 I always love testing brands that are new to this site as it then enables me to expand the base of optics for you to read about and discover here on BBR. 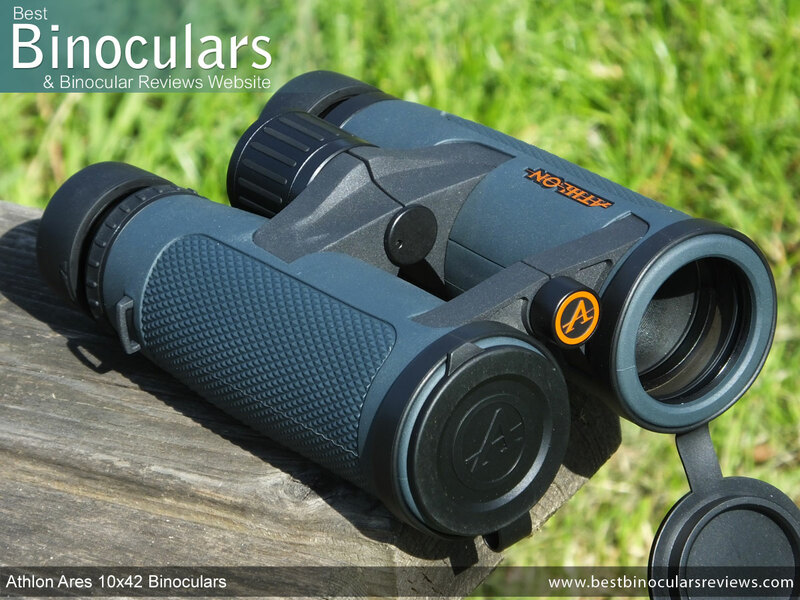 So when Athlon Optics contacted me, I immediately grabbed the chance with both hands to review their products as I have heard a lot of good things about them on forums and within the birding and hunting communities, but up until now have never actually used a pair myself. Whilst the plan I have with every manufacturer that I deal with is to always to review a wide spectrum of their products, the emphasis for me is always on the mid range to higher quality / more serious instruments as these are usually the ones that interest me the most and which are also usually the pairs that I feel most confident in recommending to you the reader. With this in mind, when the guys at Athlon asked me which pair I would first like to try out, I suggested a pair from their mid-to high end Ares series. Whilst the Athlon Cronus is their flagship series, I thought that the Ares looked to be very close to them in terms of features and components, yet is quite a lot cheaper and so would possibly offer great value for money and thus be well worth bringing to everyone's attention. Indeed in Athlon's own words, the Ares "bring super-premium clarity and brightness within the reach of most avid enthusiasts". 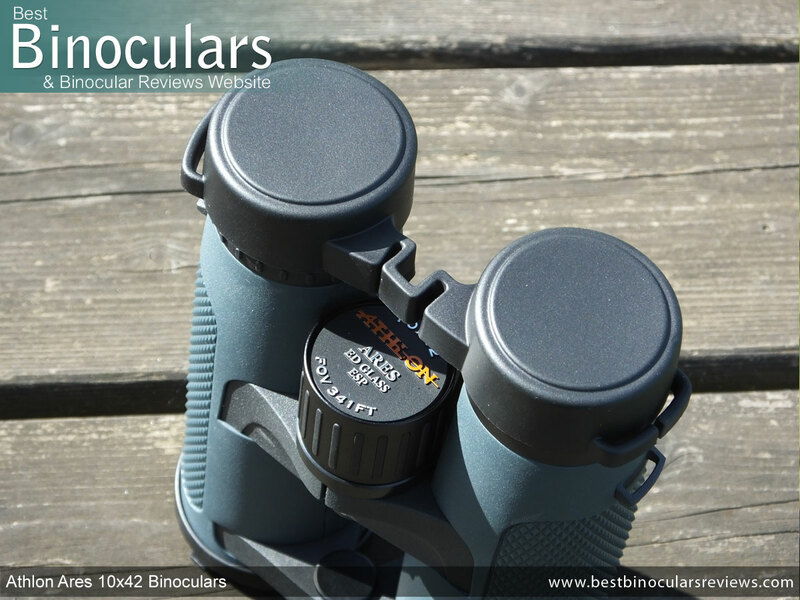 These Athlon Ares binoculars have what is now a fairly common open bridge design with two separate hinges connecting the barrels together and a large open area separating them. Potentially this body design with less body material used can also help with weight saving, but in reality, the hinges need to be beefed up and so often does not work out that way. What this free space does do is leave you with a really nice secure area to hold onto, which when holding your optics one handed is a nice feature that I really appreciate when traversing terrain where I need to use my other hand to hold onto something etc. As with with their top of the range Cronus and most good high end instruments, the Athlon Ares 10x42 binocular has a chassis made from magnesium, which is more robust and has to be said exudes more class than the polycarbonate shells found on lower quality/cheaper instruments. I really like the exterior dark green rubberized coating that Athlon Optics have used on the Ares. Thicker than many, it still fits very tightly to the chassis (this is a complaint that I have with many thicker rubber covers as some can slip or move about a fraction). The main plus side of this thicker rubber is that it offers increased impact protection and whist the rubber they have used is also very hard and thus mostly smooth, it's thickness means that Athelon have been able to imprint a really substantial and thus very effective diamond pattern to improve the grip levels. The dull green color makes for good camouflage and the exposed metal sections on the bridges also have a matt non smooth finish to reduce light reflecting off them, which for many users, but especially hunting is really important. 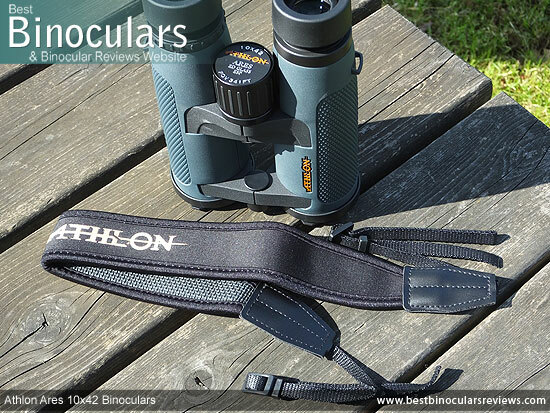 Whilst Athlon Optics do not quantify it with a time or depth, they do state that this instrument is waterproof and protected from "the harshest weather conditions or if accidentally submerged underwater". This to my understanding should mean that they have more than enough moisture protection for most 'normal' uses. Also worth keeping in mind is that a sealed instrument is also protected from dust in dry conditions, which I find is equally as important, or even more so depending on your situation. Unlike the majority of optics that use Nitrogen gas, Athlon Optics have opted to use Argon gas for the Fog Proofing in these optics. They say that this gives better thermal stability, which may be true, but I have also read that both gasses are equally as effective. Either way the dry internal environment should mean these shouldn't fog up if you put them through rapid temperature changes (like going from a warm house and into a very cold winters morning walk outdoors). 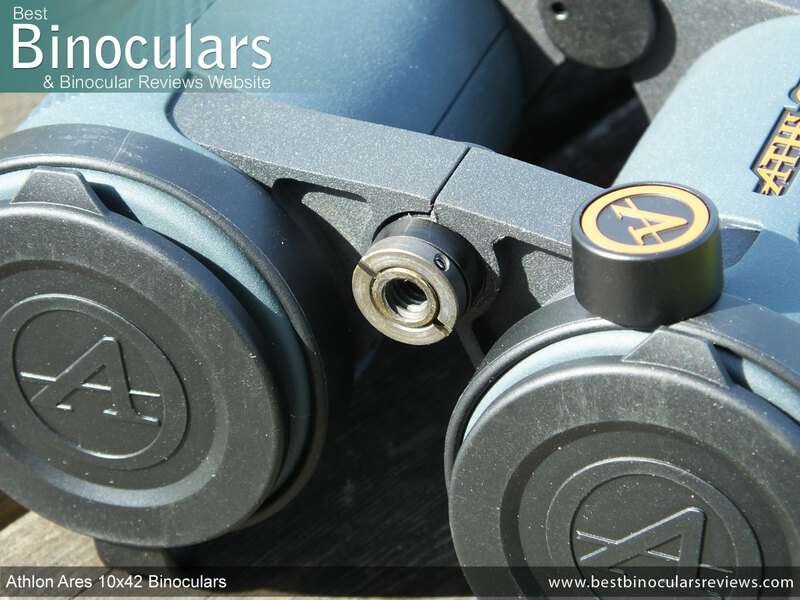 The two bridges and their hinges are made from metal and feel very robust, which are important features to ensure that the optics does not go out of alignment even when dropped. The hinges on my sample pair of Athlon Ares binoculars also had a good amount of resistance to them. What I mean by this is that they are just easy enough to open and close, but too loose so that they open or close unintentionally. The IPD range (distance between the centers of the eye-pieces) on these goes from 5.6cm to 7.3cm, which as you can see from this document on Interpupillary Distance on Binoculars, is fairly standard for this size and class of device. As with the majority of modern bins, these are 'tripod adaptable' and by this I mean that they can very easily be fixed onto a tripod by using a standard tripod adapter that screws into the front hinge bin after you have unscrewed and removed the dust cover as shown in the image above. 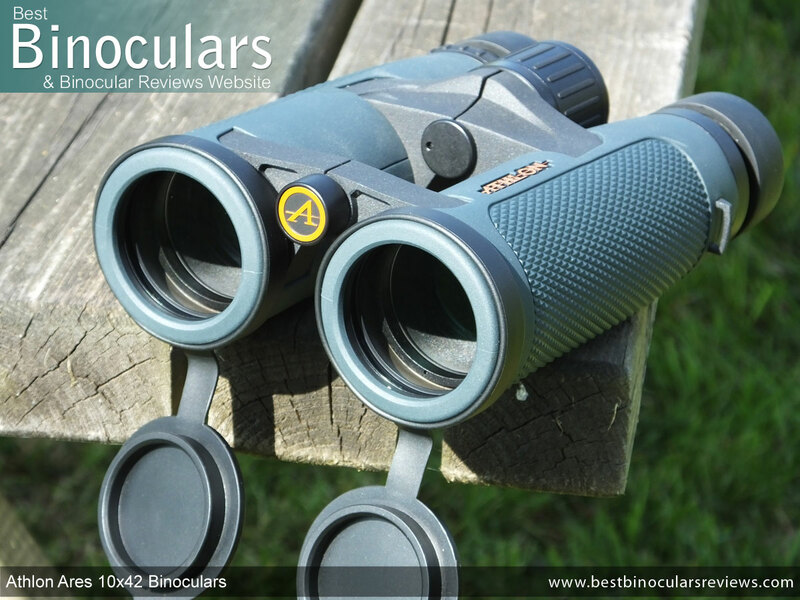 These Athlon Ares 10x42 binoculars and indeed all the other models within this series use twist-up eyecups and have eye-piece housings made from metal (magnesium?). This is good as some manufacturers will try and cut production cost by using plastic housings. Which considering that this one of the areas on a bin that most often gets damaged when dropped, it is important that they are as strong as possible. I found the twisting mechanism of the cups on my sample pair to work very well and by that I mean they also felt robust, lacked any free play or looseness and they rested/stopped very securely into the maximum, minimum and mid point settings. Comfort wise, they are fairly typical in that they have a thin and rather hard rubber covering over the cups that does just enough so as to make them not uncomfortable. Their external diameter of 41mm is also fairly typical for this size class, so not too much to report here. 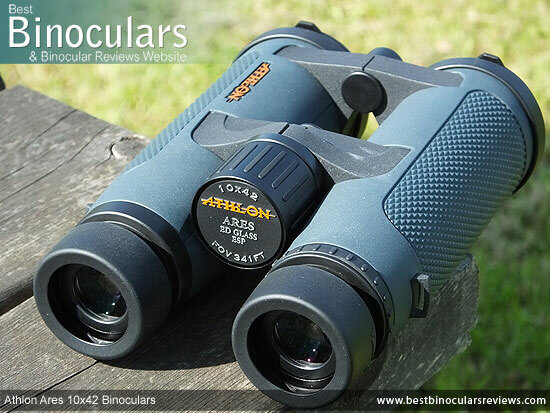 The 10x42 Athlon Ares binocular has 14.7mm of eye-relief and as I mentioned earlier, only 1 intermediate click-stop. For those who wear glasses this may be an issue as you have less space to play with that what would be ideal. The diopter is really important in that it enables you to focus one barrel independently of the other and thus calibrate your instrument so that it compensates for any differences between the vision in your left and right eyes. However once set, you only really need to change your setting if you share your bins with someone else who has perhaps has different eyesight. So it is also important or at least less of a pain if it remains fixed at whatever setting you have set it to. It is for this reason that I really like diopters to be lockable, which unfortunately these are not and strangely enough not many are. However I will say that my sample did have a good amount of friction and it's low profile design means that accidental movement should not occur too easily or often. I think one thing that is also lacking here is a scale or at least some sort of differentiation in the markings, which would make it easier for you to remember your particular setting and thus be able to return to that point without having to re-calibrate if it has move accidentally or if like me your kids get hold of your bins and play with all the settings! Of course a quick fix to this is to make a mark with a pen or even a small notch with a knife, but I feel that you really should not have to. Firstly this large size along with it's prominent position makes it nice and easy to reach, no matter your hand size or hand position you use. Secondly I think you gain a slight mechanical advantage in the gearing. I could be wrong here, but in theory, it should make it easier to turn. However and to be honest, I never really noticed any major difference here. But what I will say is that the tightness of the wheel on my sample was spot on. Not too tight making it hard to turn the wheel which can be a real pain on some, especially when trying to make very fine focus adjustments, but at the same time it was not too loose, which can equally be a problem as you can unintentionally change the focus too easily. 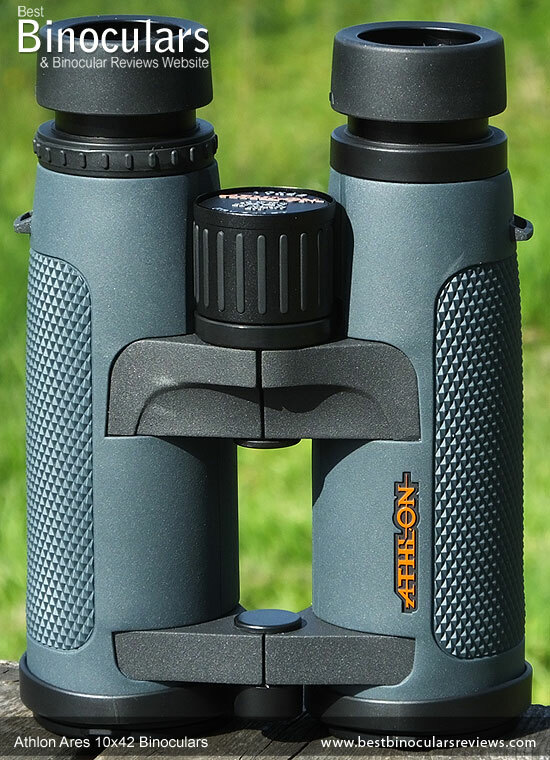 Also important to mention here is that there was zero free play or rough sections at any point along the focal plane on my sample pair of Athlon Ares 10x42 binoculars. In terms of gearing, it takes 1.5 turns of the wheel (540° of rotation) to go from one extreme to the other (near to far focus or far to near), which in my experience is fairly neutral. So a good compromise between how quick it is to make large focus changes and how easy it is to be accurate when making fine adjustments. Athlon Optics do not include any of the dimensions with this instrument, so I don't have any 'official' figures, however I measured my sample and as you can see from the results, they are on the larger end of the scale for a 42mm binocular. However like their weight, in the hands, I really never 'felt' that they were noticeably larger than most others that I test, so unless you specifically need a small 42mm bin, then it is not something that I would be concerned about. 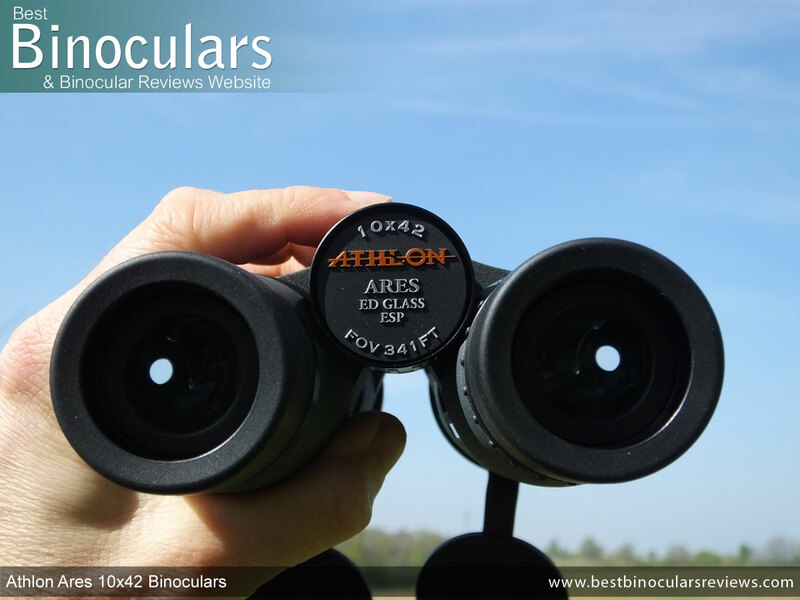 No information is offered by Athlon as to the exact makeup of the lens system used in the eyepiece of the Ares, so all I can add is that I measured the external element to be 21mm in diameter, which is about a millimeter less than the majority that I have tested on 42mm binoculars. The 42mm objective lenses are set 6mm back from the ends of the barrels. This offers them a good level of protection, but it is not quite as much (or as deep) as that which I see on many others that I test. 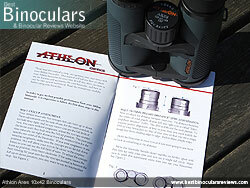 Athlon do not shout as loud as most manufacturers about the use of ED glass elements used within their lenses which is interesting and so whilst for whatever reason they have decided not to call these their Athlon Ares ED Binoculars, they do actually contain extra-low dispersion (ED) glass in the lenses. An optical system that is well designed and which contains ED glass elements is potentially able to reduce chromatic aberrations more than standard low dispersion glass and thus can offer up an image that shows less color fringing around the edges of the view. It is important to point out at this point that by simply using ED glass does not guarantee this result as the design of the whole optical system has to be taken into account and I have often observed well made non ED glass bins show as little fringing as those that do. To see how these actually performed in this area, take a look at my section on Image Quality below. These and all models within the Athlon Ares series use roof prisms to correct the inverted image created as the light passes through the lenses. These prisms are made from BaK-4 glass, which for the use within binoculars is generally considered to be better than BK-7 glass. I really like the fact that Athlon have added a protective coating to the external lens surfaces. Not enough bins have this in my opinion, but it really has the potential to prolong the perfect image quality of your instrument. Those that do add similar coatings generally have their own name for them Athlon it their XPL Coating (Xtra Protective Layer coating), but which they say will not only protect from scratching, but also helps reduce marking or dirt collecting on them. This in turn means you have to clean them less often, which is always a good thing. 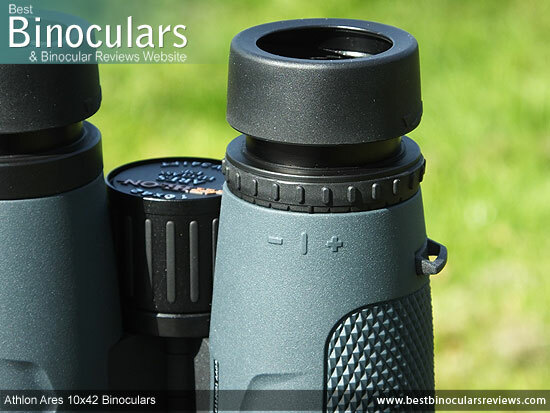 As you would expect from any instrument at this level, the optical system on these has been Fully Multi-Coated with a anti-reflection material. This implies that meaning every single glass surfaces throughout the whole system has multiple coatings of this material added to them. This is important as cheaper bins will use single coatings on only some of the lens surfaces (usually only the exterior ones) and does make a marked difference in the image. 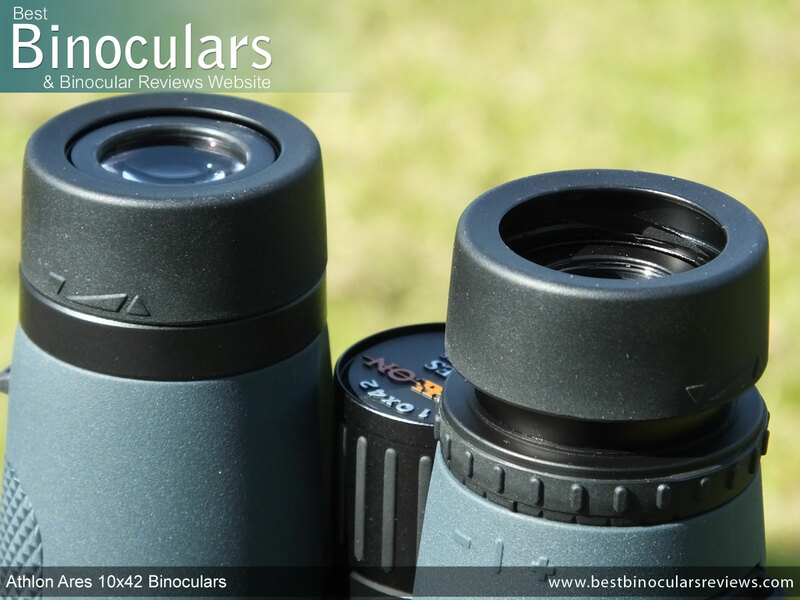 Impressively, the Ares has dielectric mirror coatings on their prisms, which have the highest level of reflectivity and which because of the price to manufacture are only found on really high end optics. This results in a brighter and better quality image than those that use materials with a lower reflectivity index. Also very good to know is that the prisms have also been 'phase corrected'. What this means is that they have bean treated with a material that corrects the problem of "phase shift" that occurs as light passes through a roof prism. Untreated prisms will deliver a lower resolution image with less contrast. I think this will be of real interest to birders who often observe birds from longer distances (like at the coast or lakes for example). Many hunters and wildlife observes will also appreciate a wide angle 10x binocular like these. For a full sized bin with a power of between 8x and 10x, a minimum close focus of 6ft or less is what I would call excellent. So at 8.2ft, these Athlon binoculars do fall a little short (or long!) of that. So fine for occasional close range observation, but if that is your main intended use, I would consider another option. 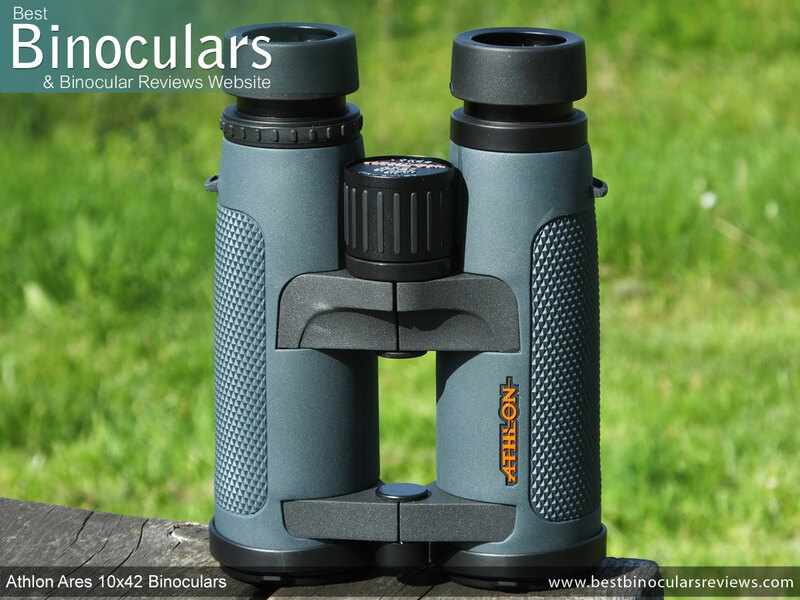 The really wide field of view means that you almost certainly have to make sacrifices in other areas, so it is not surprising to me to see that the 10x42 Ares lacks a little in this area when compared to others in this size and magnification class. However it must be said that whilst I cannot class them as having Long Eye-Relief, the 14.7mm that they do have is not too bad at all: For those who don't wear eye-glasses whilst binning, this will be of no consequence at all anyway, but for those who do, I believe that the 14.7mm may just be enough for many eye-glass wearers. To test this, I twisted down the cups and then put on my sunglasses and I have to say that I was then just about able to see the full image. So depending on your face shape and the depth at which your glasses sit from your face, it may mean that you to will have enough space to get the full view. I was very happy with both the level of contrast and the color reproduction on the 10x42 Athlon Ares. I thought that the colors were vivid, but not too much, so as to look unnatural. I can also say the same for the contrast as there is a good differentiation between dark and light and thus the image has a good sense of depth to it. Sometimes a low contrast can make the view look flat and either washed out or dull. This was not the case on these. In good light during the day, they looked as bright as my mid-range control. For interest I also compared the view to that of my very high end 8x42 control bin and whilst I thought that my 8x42 was brighter, the difference was extremely minimal and I had to look back and forth between the two many times just to make sure. In some ways this is to be expected as during the day, the smaller exit pupil on the 10x42 is still supplying my eyes with more than enough light. 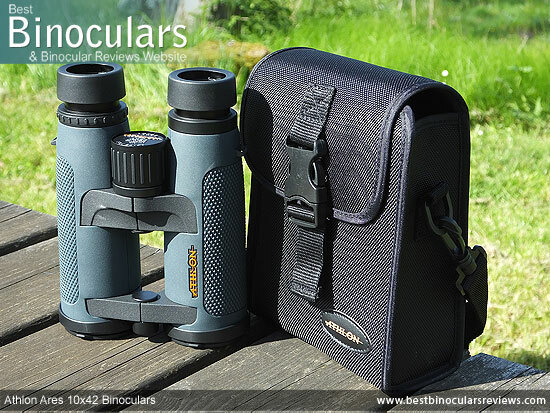 However if the quality of the optics is poor, a binocular can still look to have a dull image compared to a high end instrument. It is for this reason that the fact that they were so close is important. In the evening, I compare all three again. This time I could notice that the Athlon performed somewhat better than my normal 10x42 control, but also lagged a fraction more behind my 'Alpha' 8x42 control. Again these small differences are understandable and to be expected, especially when comparing an 8x42 vs a 10x42 at this time because of the different sized exit pupils. Taking all this into account, I would say that in terms of image brightness and low light capabilities, these are really very good rank right up there with the best high end 10x42 bins that I have used. The amount of color fringing that these Ares bins display is very nominal. Indeed even under extremes, like looking at the edges of black telephone wires against a bright blue sky, the amount of fringing that I observed was less than my mid-range 10x42 control and no different than my very high end 8x42 binocular. This is super impressive as a higher magnification usually translates to more fringing and so for them to match a top end 8x42 is very good. Here the expert use of extra-low dispersion (ED) glass has really paid off. Once again, in terms of the level of image softening that you often see right around the edge of the view, these Athlon Ares bins performed better than my 10x42 control as the amount was almost zero - very impressive. The image as a whole also looked completely 'flat' to me, now that may sound bad, but what I mean is that there were no obvious distortions at any point, right from the center to the outer edges that some bins display where the view looks curved or wavy. 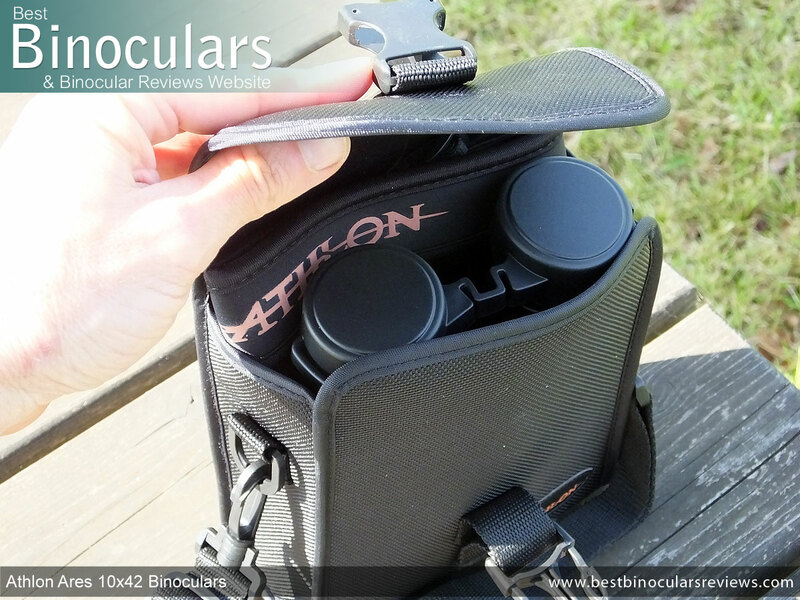 Whilst it is well made and perfectly functional and as you can see below has a lot of good points to it, I have to say that I was a little underwhelmed with the Athlon carry case. I say this not because it is any worse than many at this level, but with the quality of the instrument being so high, it would have been great to see the case match this and also rise up above the crowd. 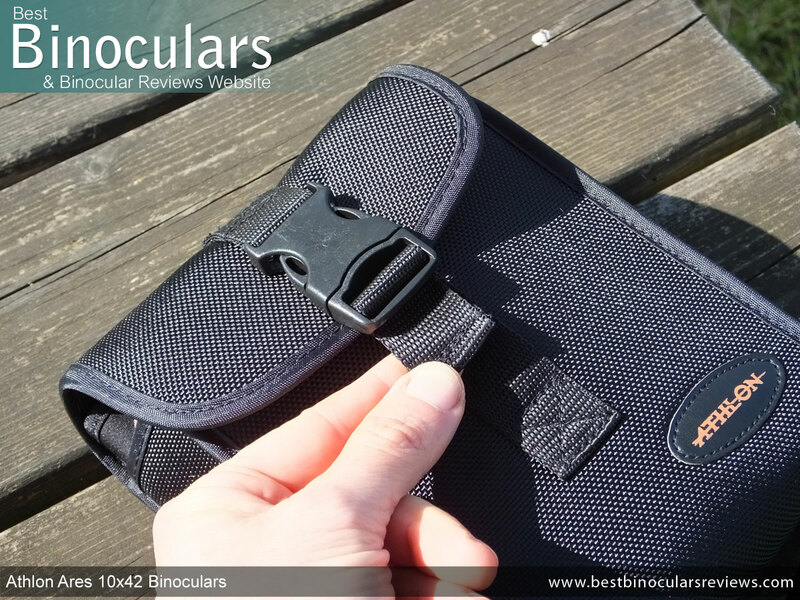 Fastening cord can be length adjusted - this is important as it means that you can lengthen it and thus close the lid when storing the bins with the eye-cups extended, lens covers in place and with the neck strap stored within the bag. Surprisingly, not enough manufacturers think of this detail! The neckstrap is similar to the case in that it is perfectly functional, but just lacks some of the finer details and class of the best ones out there. It attaches to the binos in the normal way using a slider that enables you to adjust the length of the strap. Here some of the better straps will also have quick release clips so that you can quickly remove or replace the strap without having to thread it though the eyelets on the sides of the bin and then back on itself every time. Which if you are like me and you like to either not have the clutter of a strap at times or wish to fix your bins to a harness, can be a pain to have to do every time. The padded section is good in that there is plenty of padding and it is curved to fit better over your shoulders. I also like the high grip rubberized material on the underside that helps to stop the strap from sliding about. The two sections (padded and thin straps) are sewn together and reinforced with a faux leather flap. Here the stitching is good, so I don't see it coming apart too easily. The soft plastic that it is made from and the flexible bridge in between the two cups mean that they can be replaced without having to open up and thus loose your IPD setting every time. This is a small thing, but compared to the inflexible rain-guards is far less annoying and is something that I really do appreciate. 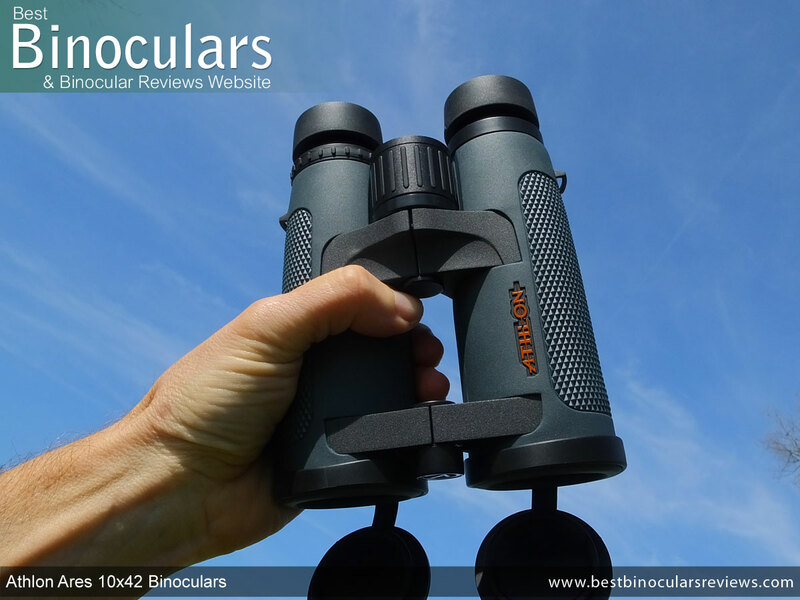 Also good is the fit of the cups over the eye-cups on the binocular, meaning that the guard will not fall off too easily by accident and thus leave your lenses exposed. This is another small detail that is missed on many instruments and so which I feel is well worth highlighting. 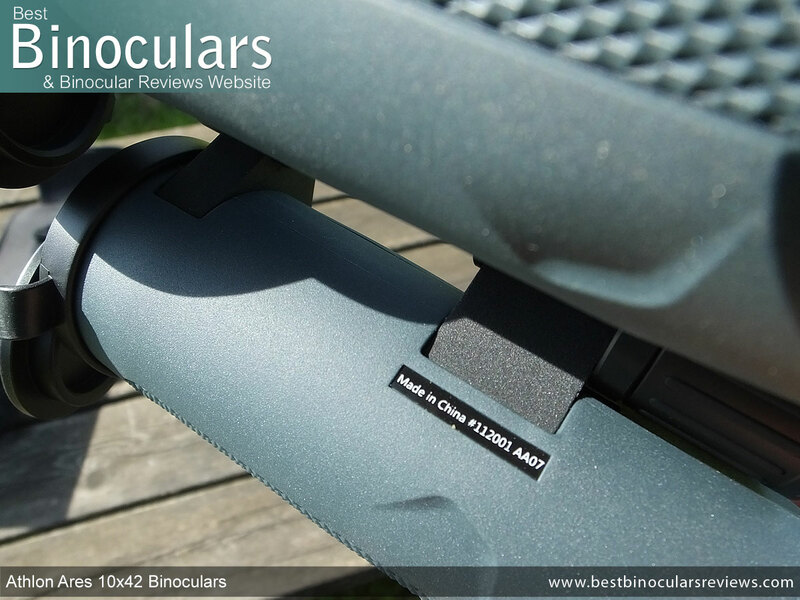 The included objective lens covers are excellent and in contrast to the rain-guard are not at all generic in that they contain embossed Athlon logos on them. A tiny detail I know, but to me these small things are often what finally can make someone choose between tow very closely matched binos. Another feature that I like on these lens covers is that they fit into the ends of the barrels and not over the ends of them like many others. This just looks a whole lot cleaner and more professional looking and makes them appear more a part of the instrument as a whole and less like something just stuck onto them. Here once again the fit is good and so will take quite a lot for them to fall away accidentally. Lastly I like the fact that they are tethered to the binocular via a separate ring that goes around the barrel. This ensures that they are always handy to quickly replace and you don't have to go searching through your pockets or carry bag to find them. These bins come with a reasonably good quality cleaning cloth, fine for using on the body and I would say emergency use when out in the field. But for thorough cleaning of the lenses I would still suggest getting a Lens Cleaning Kit. Now I know this may sound trivial to some, but most instruction manuals that come with bins are poor at best and really do just look like an afterthought or something that is done because the manufacturer has to. 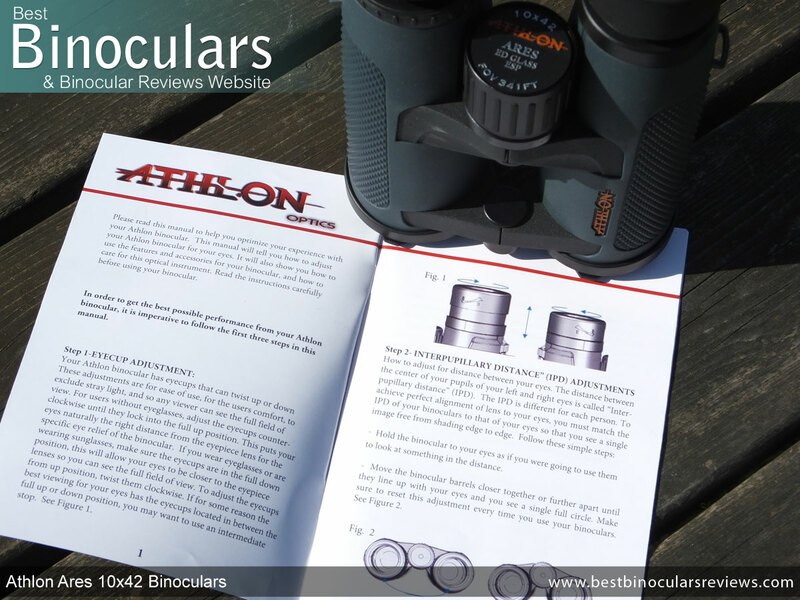 This thankfully is not the case with the Athlon Ares 10x42 binocular as the included booklet is both clear and comprehensive. Excellent. 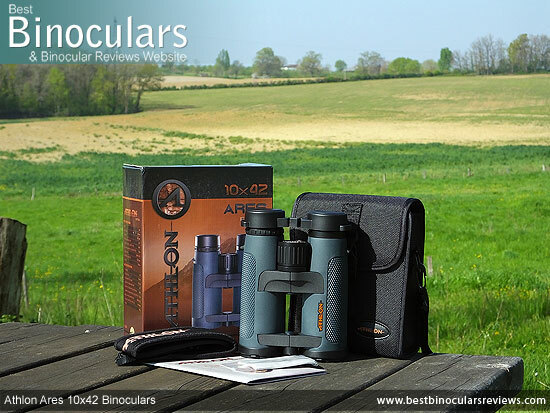 These and I believe all other Athlon binoculars are warranted to be free of defects in materials and workmanship for the lifetime of the product which is excellent and shows the high level of confidence that they have in their products. These Athlon Ares binoculars have a really wide field of view for a 10x powered instrument, indeed at 341ft at 1000 yards, it is as wide as many good 8x binoculars! 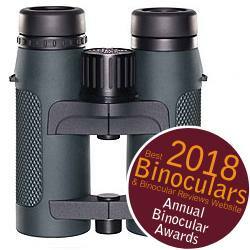 As I mentioned in the review, the fact that you get such a wide field of view on this instrument, means you have to expect to compensate in other areas. So whilst I would not call it a huge weakness, the amount of eye-relief is a less than ideal for those who need or want to wear eye-glasses whilst binning. For those of use who don't this is really not a problem at all. Also worth mentioning here is that the minimum close focus is a little more than on some 10x42's. But I think to be fair to Athlon it is not so much a weakness, more like it is not one of the Ares' strengths. Again this is not a major weakness as they both work fine, but I did feel that both the neck strap and the carry case are just not up to the same level in terms of luxuriousness and that feeling of quality that you get with instrument itself. I would like to thank you for spending your time reading my Athlon Ares 10x42 review, it means a lot to me. 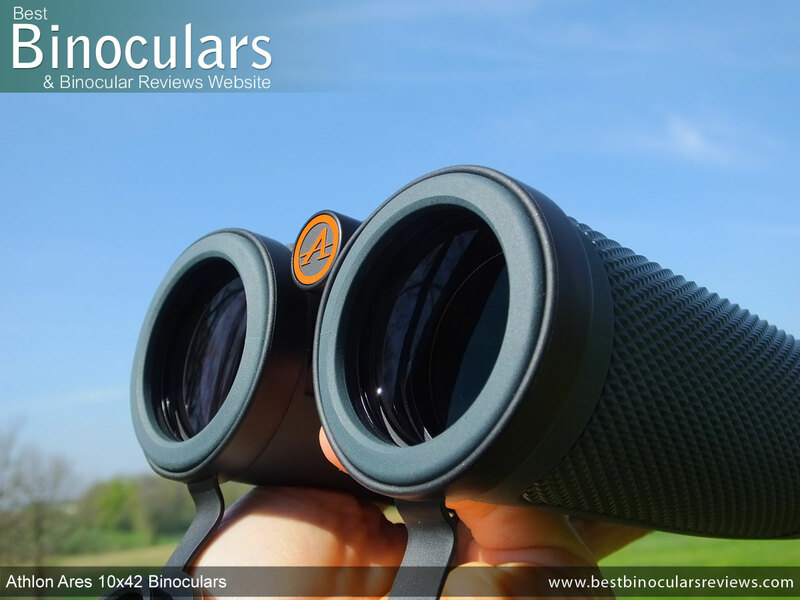 One last point I would like to emphasize is that unlike many so called "reviews" that you will most have certainly come across on the web, this one as indeed all others here on BBR is my truthful and honest opinion of the product which I only finalized after completely researching, testing and using them in real world conditions.